Similar in price to free range chicken, guinea fowl is just as versatile and easy to cook. It has a slightly gamey flavour, and is delicious with this Chinese-inspired sauce. Preheat the oven to 200°C, gas mark 6. Rub the guinea fowl with pepper on both sides and place in a small roasting or baking dish. Drizzle with the oil then roast for 20 minutes. Meanwhile, make the sauce by blending the cornflour with 1 tablespoon of the orange juice. Place in a small saucepan with the orange zest, remaining juice, the sugar, ginger and salad onions. Bring to a simmer, stirring continuously, until the sauce has thickened and is smooth and glossy. Simmer for 2 minutes. Remove the guinea fowl from the oven and pour the sauce over them. Return to the oven and cook for a further 5 minutes, or until they are thoroughly cooked with no pink meat. Cook the noodles according to pack instructions and drain. Divide between 2 plates, place a guinea fowl breast on top of each and spoon over the sauce. 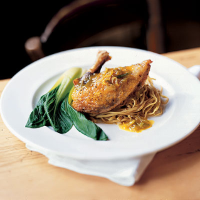 Serve with steamed green pak choi. Use 2 large chicken breasts instead of the guinea fowl, if you prefer.